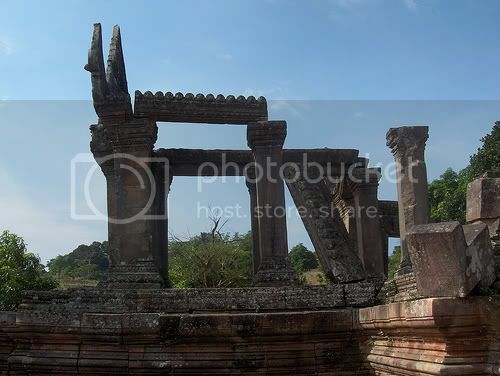 19 November 2007 (Earthtimes.org, Bangkok Post) – Preah Vihear, a hotly contested khmer temple that straddles between the Thai and Cambodian borders is to be renovated by a neutral party – the Archaeological Survey of India. The temple sits on a high cliff and rests on Cambodian soil; however, entrance into the temple is via the Thai side of the border. I’m not sure how this move resolves any diplomatic tensions over the site, however. The other interesting aspect of the two stories is the involvement of the Archaeological Survey of India, which has been active in restoring many Hindu temples throughout Southeast Asia. Notably, it had helped restore the Prambanan temples in Indonesia after it as damaged during last year’s earthquake as well as the Ta Prohm, another Angkoran temple. An 11th century temple in Cambodia, located near its border with Thailand and the subject of lingering tension between the two Southeast Asian countries, will now be renovated by India. The Preah Vihear temple has been in the limelight this year over Cambodia’s bid to get a Unesco world heritage status for it, but was objected to by Thailand. A senior official in the external affairs ministry said Cambodia had approached India to take up the conservation of the Preah Vihear temple about six months ago. ‘The request had been routed through our ambassador,’ the official, who could not be identified as per service rules, told IANS. The government has already asked the Archaeological Survey of India (ASI) to start work on a conservation plan for the temple. It is expected that an announcement would be made to coincide with the visit of Cambodian Prime Minister Hun Sen to India next month. India has been conducting temple diplomacy across Southeast Asia, harnessing the ASI to renovate important medieval temples in the region built by dynasties that had links with India. An ASI team has been conserving the Ta Phrom temple in Cambodia’s world-famous Angkor Wat complex since 2004, with the Indian Institute of Technology in Chennai conducting the structural study. Similarly, ASI had also been asked to draw up a conservation plan for the ruins of Wat Phou temple in Southern Laos. In Indonesia, Indian archaeologists are helping to renovate the Hindu temples at Prambanan, Yogyakarta, that were damaged by the 2006 Java earthquake. Indian diplomats said the strategy is to stress the common cultural links between India and Southeast Asia as medieval trade links with south Indian kingdoms led to the spread of Indian religion, language and culture in the region. The Preah Vihear temple built during the Khmer empire is perched on a cliff in Dangrek Mountains, just across the Thai border. In fact, the easiest access to the temple is from the Thai side, while the Cambodian way is a ride through a mountain dirt road. With its grand causeway climbing up the hill, the temple is supposed to be a stylised representation of Mount Meru, the habitat of gods according to Hindu mythology. Among the sculptures carved on the walls is a depiction of the Hindu mythological story of ‘churning of the ocean’. In 1962, the International Court of Justice had ruled that the temple was firmly in Cambodia. But with the country plunging into civil war soon after, the temple witnessed pitched battles between the Khmer rouge and the Cambodian army, with the former using it as a military camp. Cambodian has approached India to renovate and maintain the controversial 11th century Khao Phra Viharn temple at the Thai-Cambodian border. It is expected that an announcement will be made during the visit to India of Cambodian Prime Minister Hun Sen next month. The temple, known as Preah Vihear in Khmer, reverted to Cambodian control 45 years ago when the World Court decided a lawsuit in Cambodia’s favour. But it sits atop a high cliff and cannot be easily accessed from inside Cambodia. Instead, worshippers, pilgrims and tourists usually enter from the Thailand side of the frontier. A senior official in the external affairs ministry of India said Cambodia had approached India to take up the conservation of the Preah Vihear temple about six months ago. “The request had been routed through our ambassador,” the Indian news agency IANS quoted the official, who it said could not be identified. The Indian government has already asked the Archaeological Survey of India (ASI) to start work on a conservation plan for the temple. The Preah Vihear temple built during the Khmer empire is perched on a cliff in Dangrek Mountains, just across the Thai border. With its grand causeway climbing up the hill, the temple is supposed to be a stylised representation of Mount Meru, the habitat of gods according to Hindu mythology. Among the sculptures carved on the walls is a depiction of the Hindu mythological story of “churning of the ocean”. In 1962, the International Court of Justice ruled that the temple was firmly in Cambodia. But with the country plunged into civil war after 1970, the Khmer Rouge used the temple as a military campl, and it was the scene of some pitched battles. Before the court case, Cambodia severed diplomatic ties with Thailand. Thailand sealed the border, and there were almost daily anti-Cambodia protests in Bangkok and the provinces, some with hundreds of thousands protesting what they called Cambodian seizure of Thai land. When the Court gave the temple to Cambodia despite the pleading of official Thai advocate M.R. Seni Pramoj, dictator Field Marshal Sarit Thanarat threatened to blockade the temple and prevent Cambodia from taking control. His Majesty the King intervened, saying the court’s order would be obeyed. Thailand and Cambodia have had frequent spats over the temple since then. The latest was last June, when Thailand asked Unesco to dismiss a request by Cambodia to grant the temple status as a world heritage site. Unesco sided with Thailand but also asked Cambodia to reapply in 2008 with a joint management plan with Thailand. At that time, the Thai embassy in Phnom Penh warned Thai citizens in Cambodia to remain on alert for possible riots. There was no violence, however. Even now, while a majority of the visitors come from Thailand to the temple, they are greeted by a large Cambodian flag atop the temple and a signboard, “I have pride to be born as a Khmer”.